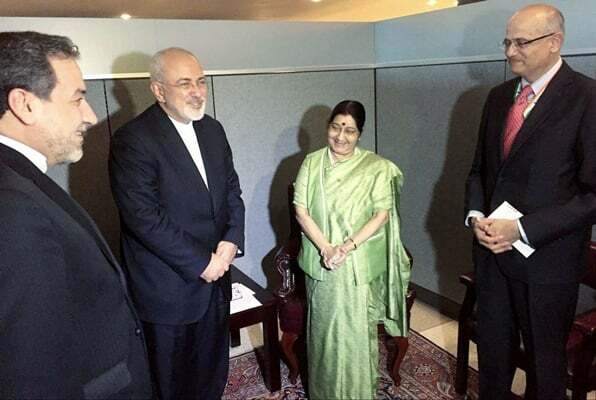 Iranian Foreign Minister Mohammad Javad Zarif and his Indian counterpart Sushma Swaraj have discussed ways to expand mutual economic ties between the two sides in a Wednesday meeting in New York. During the talks held on the sidelines of the 73th Session of the UN General Assembly, the Indian external affairs minister highlighted the significance of economic ties with Tehran, and said her country views Iran not only as a good neighbour but also a good friend. She also underlined that India will continue to buy oil from Iran despite US sanctions. The two top diplomats also discussed ways to promote banking cooperation. They also exchanged views on the development of Iran’s Chabahar Port as well as the two countries’ mutual and multilateral cooperation based on the port’s trade capacity. Earlier, Zarif said in an interview that Iran expects Chabahar Port to become even larger with more capacity. “We hope India and other investors would come to Chabahar and make investment for the expansion of the port facilities,” he told ANI. The Chabahar port complex is expected to be developed as part of a new transportation corridor for land-locked Afghanistan. India and Iran signed an agreement worth $85 million to develop the port in south-eastern Iran.